Startseite 〉 Mehr Sprachen! 〉  English 〉 Participate! 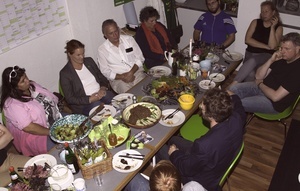 Those interested in green politics can get information in the Members‘ Meetings as well as monthly gatherings of the ‚Light Greens‘ (see ‚Hellgrüner Stammtisch‘ on the page ‚work teams‘). Direct participation, however, is offered to everyone within the work teams. They are grassroot democracy and citizen participation in action. The Brunswick Greens may also be contacted via the managers of our locals organisation. We warmly invite everyone interested in Green politics – regardless of membership – to our meetings and to join our work. Those who miss their mother tongue on our internet site or want to help us by translation into other languages we ask to contact the work team ‚Arbeitsgruppe Integration‘ via email to Andreas.